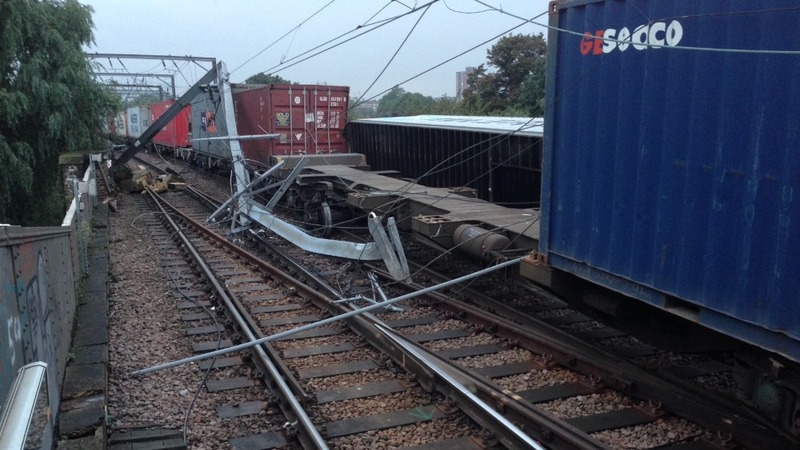 Network Rail says a derailment early this morning at Camden Road has caused extensive damage to overhead wires. It means services will not be run between Stratford and Gospel Oak until further notice. Early indications show that the line is expected to remain closed for a number of days. Freightliner 66589 at the head of the 4E24 Grain- Leeds is signalled onto the North London Incline as it passes through Camden Road station on 16 December. The train will shortly turn south off the NLL at Camden Road East Junction and run over the freight-only link to reach the ECML at Freight Terminal Junction, just south of Copenhagen Tunnel. Westbound containers from Felixstowe destined for the Midlands rumble across the bridge spanning the A503 and through Camden Road station in July 2005. The route is part of the heavily used freight corridor between Stratford and Willesden Junction on the North London Line. Locomotive is GBRf 66716.